Mill Lane Studio: Which shall I Wear? Siam....or Golden Shadow? Which shall I Wear? Siam....or Golden Shadow? Decisions, decisions! Which earrings shall I wear? One of the benefits of custom design jewellery is getting exactly what you want to suit your look and your personal style. 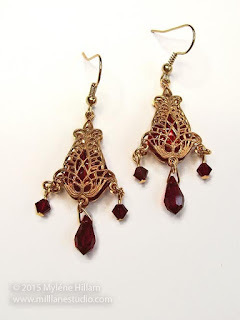 When it came time for the Creative Bride to choose her earrings, she just couldn't decide..... Siam, with its rich burgundy hue....... Or elegant Golden Shadow? So I made up one earring in each colour and when she had her dress fitting at the bridal shop she was able to try each one with the dress. They each had their merits: on the one hand, Siam matched the bridesmaids' jewellery but on the other, Golden Shadow was so flattering against her porcelain skin. 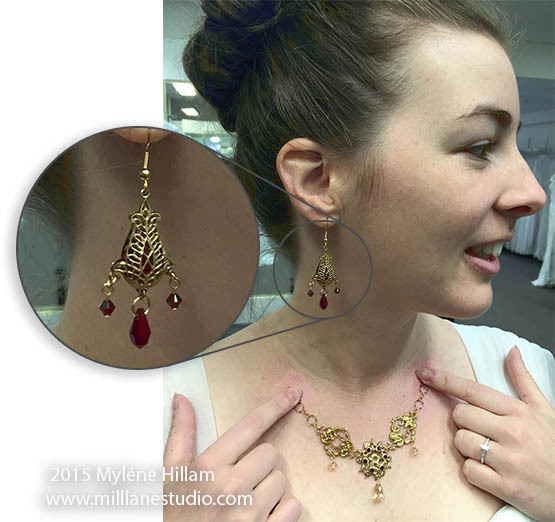 Both have a red glass heart captured within the filigree but she just couldn't decide. So I went ahead and made up the second earring of each colour so it didn't matter which way she eventually swayed. I also replaced the red heart on the Golden Shadow pair with a Golden Shadow Cosmic Drop. 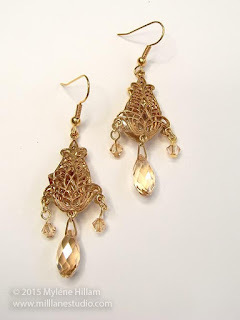 The shape and design of her earrings is very similar to the bridesmaids' but this filigree has two extra loops to dangle crystals from (you can see how to make the bridesmaids' earrings here). The red glass hearts captured within the filigree really make the Siam version glow. Whilst all the extra facets of the Briolette drops give the Golden Shadow version extra sparkle. 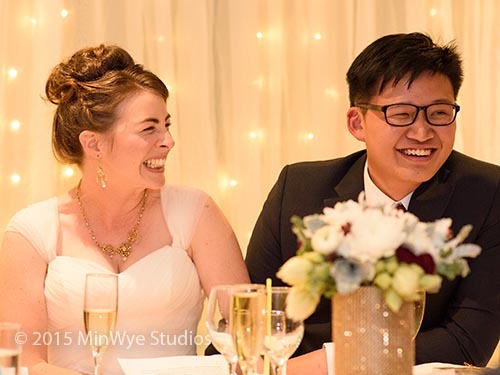 Both pairs of earrings have just the right amount of sparkle that's perfect for evening wear without saying that they're bridal jewellery so these can be brought out for other special occasions later on. The morning of the wedding came, her hair and make up was done and she was fully dressed, and for the first time, all the bridesmaids were together and dressed too. Now she could make that decision seeing the whole picture. And it was the Golden Shadow that won out - my personal favourite! What do you think? Did she made the right choice? 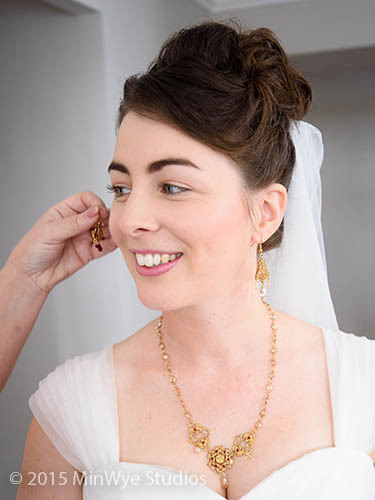 Next up, the Wedding Collection looks at the Mother of the Bride jewellery. 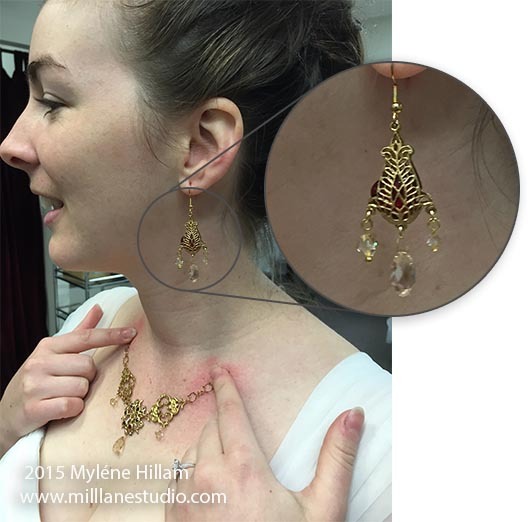 Please stop by next week to see how I put my own jewellery ensemble together.